Kieran’s and Matt’s Place Ltd (Kieran and Matt’s Place) as a home management service offers self-managed Support for Kieran and Matthew so they can have a good life with choice and control like everyone else. We are dedicated to human rights and to ensure as individuals that Kieran and Matthew continue to have choice, control, and freedom over their lives. We aim to provide professional services, advice, and support for Kieran, Matthew and their families that is community-based, dignified, person-centred and reflects their individual needs and preferences supported by people of their choice. Our goal is to be a trusted partner with Kieran and Matthew to help create a more independent life for them, now and in the future. Who are Kieran and Matt’s Team Members? Team Members include the following: Kieran and Matt, all of Kieran and Matt’s Family including brother’s sister’s. Mothers, fathers and step father. Team Members also include chosen care support staff who have a title as Team Member. Team Members play an integral role in the success of Kieran & Matts Place and the achievement of their vision and value objectives. They recognise the right of Kieran and Matthew to inclusion, participation and self-determination. Team Member personal values are required to align with Kieran and Matt’s Place and this should be demonstrated in their work and interaction with Kieran and Matt daily. 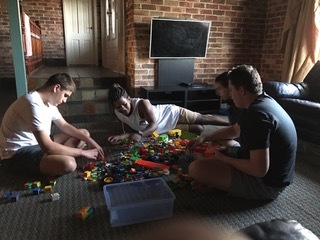 Team Members are directly responsible for the day to day support, and personal development of Kieran & Matthew enabling their participation in day program services, work services and community activities. Team Members ensure that they support Kieran and Matthew to be at the centre of their decision making and enable them to achieve their desired outcomes nominated in their NDIS plans and SIL Profiles as goals and aspirations in partnership with SILC their families and carers. Team Members ensure that supports are provided in accordance with the National Disability Services Standards and other relevant legislation and are active in advocating these rights for Kieran and Matthew.